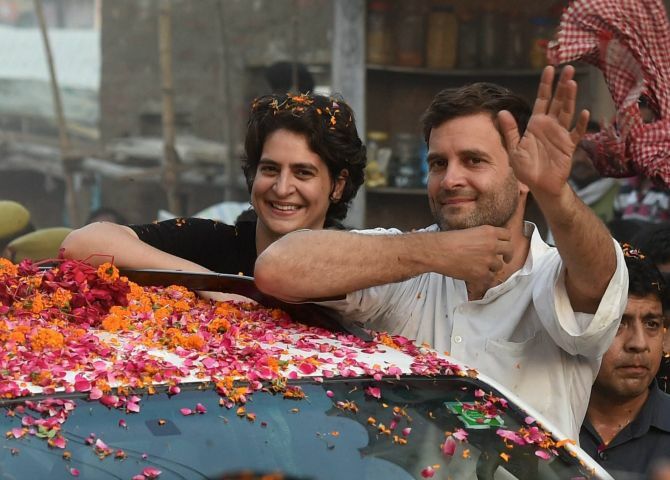 The 'will she, won't she' discussion on when and if Priyanka Gandhi would decide to move from being star campaigner and confidant for her mother Sonia Gandhi and brother Rahul Gandhi and take on a wider role for a party, seen to be moribund for a while, has finally ended. Elder brother and Congress president Rahul Gandhi appointed her All India Congress Committee general secretary of Uttar Pradesh East, in what many said would infuse energy into the party ahead of the general elections. The 47-year-old mother of two was seen as her grandmother Indira Gandhi's true inheritor, resembling her not just in looks but also in her ability to reach out to people with her easy manner. Priyanka Gandhi's strength so far has been in bringing together party workers and she is at her best during interactions with voters and workers in her family bastions Amethi and Rae Bareli, say party workers who have been clamouring for her to come into the forefront of active politics. The Bharatiya Janata Party had fielded her uncle and former Rajiv Gandhi confidant Arun Nehru from Rae Bareli and Priyanka Gandhi minced no words when she addressed the crowds. "I have a complaint against you...A man who committed treachery and who stabbed his brother in the back, how can you let such a man here? How did he dare come here?" she told voters then, making a fiery political point with effect. "She has been managing the campaign of her mother and brother for 20 years now and has the experience of handling their last five elections," said a senior party leader who has worked closely with her. Her appointment as general secretary for Uttar Pradesh East has brought cheer to party workers who have been chanting slogans like 'Priyanka lao, Congress bachao' (bring Priyanka and save the Congress) for many years now. Born on January 12, 1972, Priyanka Gandhi married to Robert Vadra, a businessman from Delhi, on February 18, 1997 in a traditional Hindu ceremony. They have two children -- son Raihan and daughter Miraya. The couple is also seen in their children's schools, taking part in Sports Day events and parent-teacher meetings just like any other parent. Party insiders feel her resemblance to her grandmother might also help the Congress' prospects.